The world wasn’t always kind to the women who star in these stories, but through Mayhew Bergman’s stunning imagination, they receive the attention they deserve. 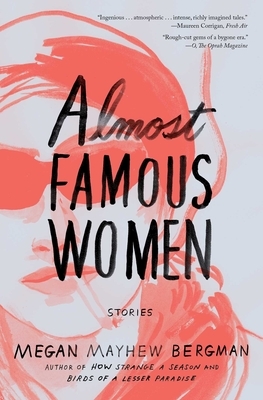 Almost Famous Women is “addictive and tantalizing, each story whetting our appetite for more” (Atlanta Journal-Constitution). "Every one of these stories is as vibrant, as urgent, as surprising as the women therein. What a thrill to listen as they cohere into a chorus of powerful, affecting and often hilarious voices, each unforgettable, together undeniable. Another stunning collection from the brilliant Megan Mayhew Bergman." "Megan Mayhew Bergman is a tremendous writer -- compassionate and intelligent, generous and funny -- and Almost Famous Women is a collection filled with empathy, insight and extraordinary psychological precision. Mayhew Bergman has made the women who inhabit this beautiful book come fully to life -- I won't ever forget them." "A collection of stories as beautiful and strange as the women who inspired them." "Rough-cut gems of a bygone era." "Fearless stories star[ring] an eccentric cavalcade." "Bergman is a spry and meticulous writer, and these stories linger in one’s memory long after reading them." "Stories that are so intriguing you wish they were full-length novels... Bergman revives these often troubled spirits with great compassion." "Real women are found at the heart of these tales, women unusual for their times and almost entirely forgotten in ours... Arresting... Sympathetic, never romanticizing often self-destructive behavior, but exploring why these women sought risk taking and the effect of their impulses." "Seek within to find the forgotten. Bergman's well-written short stories tell the tales of women who almost made it into history books." "Thrill-seeking women abound in the collection, chock-full of bravery, defiance and creativity." "There's an allure to reading about the historical lives of women who bucked social conventions, even when they come, as they so often do, to a tragic end. We read them with an element of wish-fulfillment, searching for assurances that there were other ways to think and be." "Graceful prose charged with knowingness and certitude...burns bright in one’s mind well after reading these fine stories." "Bergman’s scenarios are addictive and tantalizing, each one whetting our appetite for more... stunning depictions of how fame’s fire warms with even the slightest contact." "By assiduously depicting their intimacy and power struggles, Bergman allows for a close examination of the multiciplicty of women's experiences." "By exploring the women who didn't quite make it into history books, Bergman offers thoughtful commentary on the stories we do and don't preserve." "Ingenious… atmospheric… intense, richly imagined tales." "A cleverly constructed, honest, and thoughtful book of stories. Fans of historical fiction and biography will find much to delight and ponder in these pages." "[Bergman] nimbly animates the stories when she approaches them from tangential angles, often from the perspective of another character with something at stake." "Bergman’s 13 gutsy short stories portray women whose lives left them on the fringes of history’s conversations... Through Bergman’s exquisite writing, we dwell briefly in multiple lives that history was unkindly content to lose—but Bergman wasn’t."